If you already know about 091 Lounge-Bar, then you know there is no such thing as an ordinary night in Havana. La Foresta: a luxurious Eden. In a quiet and isolated area, appears this new luxury restaurant, which occupies an old and beautiful house of the fifties with a very modern style. Good taste is priceless. In Versus 1900, one of the newest “paladars” of Havana, everything is in its right place, nothing extra, nothing missing. Definitely you do not want to miss this place during your stay in Havana. Habana Mia 7 invites you to enjoy an interesting combination of author's cuisine with the more unusual dishes of international cuisine. Nice atmosphere, great food for a fair price in the only Scandinavian restaurant in Cuba. Moved from a 11th floor in the neighborhood of El Vedado to Central Havana, Castas & Tal has gone from being an old-fashioned "paladar" to become in a trendy restaurant bistro-style. 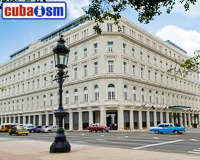 This restaurant is located on the third floor of the Sociedad Asturiana de Cuba. Nice private restaurant located in parts of an old oil factory. Excellent food, especially in the restaurant downstairs. Accessible and secretive at the same time, this restaurant is pleased to offer customers a menu at the crossroads between tradition and novelty. The combination of flavors that the Chansonnier offers it’s rare and hard to find. The mix of French and Caribbean cuisine appears in every single one of its recipes.